HE HAD NOT ONLY NOTICED THAT HIS WASHING WAS DRY ON THE LINE, HE’D BROUGHT IT IN ALL BY HIMSELF WITHOUT BEING ASKED!!!! 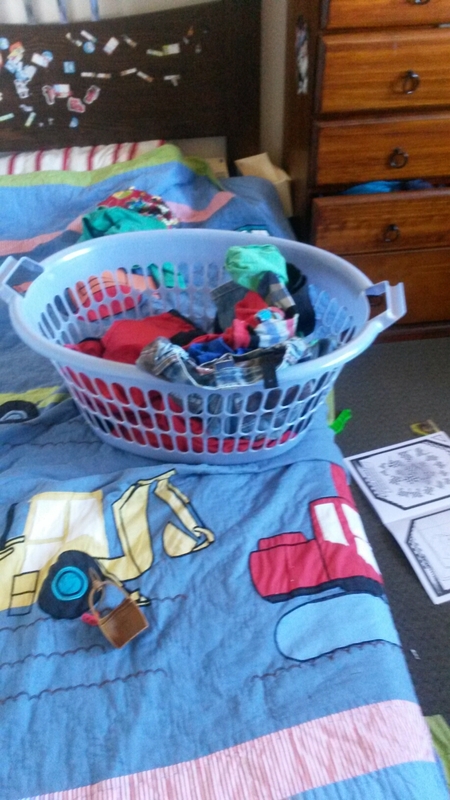 And even more impressive, he remembered I have a separate-baskets-for-each-room system, so came to me for a fresh basket to get the rest in. Sadly, his domestic prowess exceeded mine that day as every other basket was overflowing with laundry waiting to be folded. Needless to say I am waiting anxiously to see if he’ll do it again next time (and also to see exactly what dangerous method he used to reach the line, as he’s far too short to reach it without climbing on something). This is definitely a highlight of my parenting career to date!